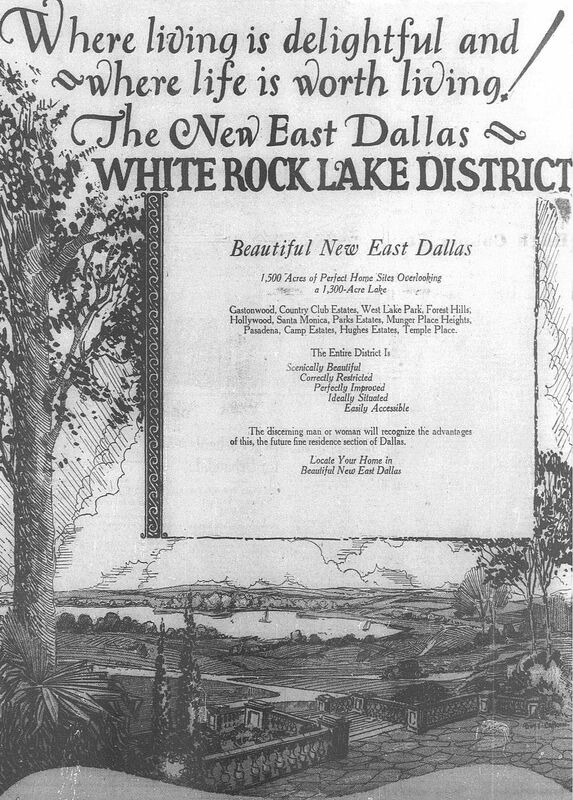 In 1926, East Dallas was in a frenzy of development. There were so many new neighborhoods: Gastonwood, Country Club Estates, West Lake Park, Forest Hills, Hollywood, Santa Monica, Parks Estates, Munger Place Heights, Pasadena, Camp Estates, Hughes Estates, Temple Place. Where living is delightful and where life is worth living! Ad from May, 1926. The detail — which shows a heart-stoppingly lovely vision of what might or might not have been a view from a home in the “White Rock Lake District” — is a Dallas I’ve never seen, but it’s one I’ll dream of. To read a very informative article (or, I think it’s probably more of an “advertorial” written by a real estate company with land holdings in East Dallas), rifle through the Dallas Morning News archives until you find the article/advertisement titled “East Dallas Section Has Fast Growth” (DMN, May 2, 1926). As I said, it’s quite informative — with detailed info on the micro neighborhoods of East Dallas, many of which I’d never heard of. There was a nine hole golf course on the Woodrow site–not sure if that is where the present day track is just outside the school. …Yep. As most of these develops were.